No doubt in interactions with friends, family, and acquaintances, one of the attributes you notice is their personality. We regularly label others as outgoing or shy, adventurous or reserved, nervous or bold. In fact, the study of personality in humans has a long and rich history. For people who regularly interact with farm animals or pets, the idea that individual animals can have their own unique temperaments or personalities would not seem far-fetched. Nonetheless, how does one define and scientifically study personality in animals? Furthermore, do animal personalities matter in the wild? Scientific study of personality (behavioral syndromes, temperament, behavioral types) in animals began in earnest in the 1990s and has expanded rapidly. Evidence of personalities has been found in virtually all animal groups, from insects and spiders to fish, reptiles, birds, and mammals. While not nearly as complex as in humans, personalities in animals help explain consistent, individual behavioral variation across different environmental situations. For example, an individual that tends to be more exploratory might also be more willing to eat unfamiliar food than a more reserved individual. The relative mix of different personalities in wild populations should change across environmental conditions that favor different behavioral tendencies. Repeatable, and therefore predictable, behavioral tendencies of particular individuals in a population can have important implications for a variety of ecological processes. Largemouth Bass (Micropterus salmoides) is a species that is both ecologically (a top predator in many of the lakes, reservoirs, and rivers of the Midwestern and Southeastern U.S.) and economically (one of the most highly sought sportfish species) important. As top predators, Largemouth Bass profoundly shape food webs and how energy moves through the food chain in freshwater ecosystems. 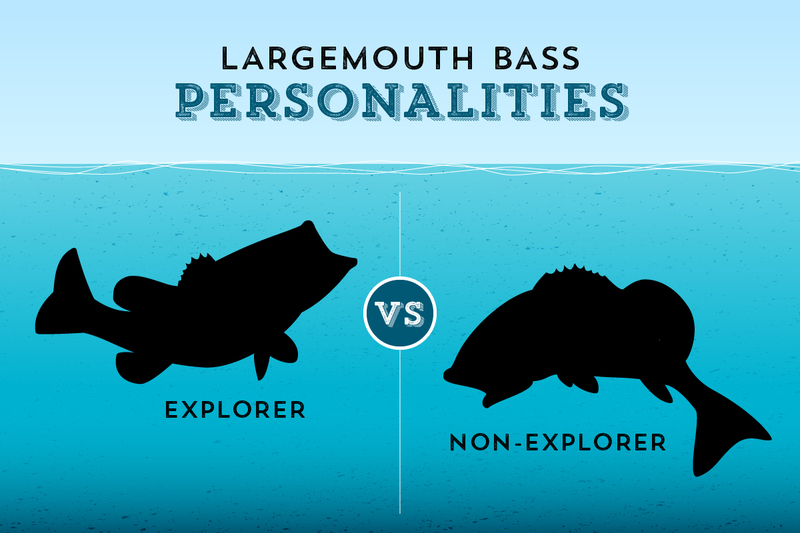 If Largemouth Bass populations contain different personalities, these behavior types could influence how predation operates in ecosystems, governing the types of habitats where they are found and the prey they consume. Largemouth Bass populations are often subjected to management initiatives, such as fishing regulations or supplemental stocking. The success of different Largemouth Bass personality types can be affected by these management actions, which can affect the ecology by reshuffling the relative abundance of behavioral types, potentially causing changes up and down the food web. Picture 1: Juvenile Largemouth Bass making a decision to explore an unfamiliar environment. Researchers at the INHS’ Sam Parr Biological Station have been examining these issues in Largemouth Bass in a series of experimental studies. 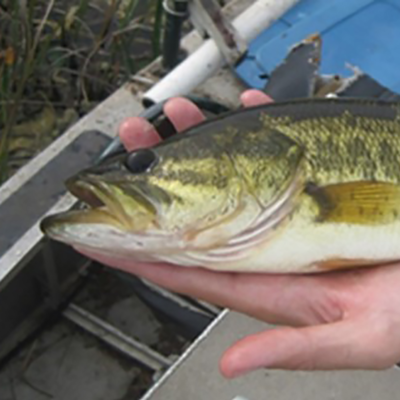 The first study looked for evidence of distinct behavioral types in Largemouth Bass. The repeatability of individual behaviors of juvenile Largemouth Bass was measured across different environmental contexts, including use of an unfamiliar environment (Picture 1), attacking an unfamiliar prey type, and the level of activity when threatened by a larger predator. Fish that were more likely to explore an unfamiliar environment were predicted to also be more likely to consume unfamiliar prey and be more active under threat of predation. Behaviors were linked between different environmental contexts, but not in the direction predicted. Fish that were more willing to explore an unfamiliar environment (explorers) consumed more prey overall. However, fish that were less willing to explore an unfamiliar environment (non-explorers) actually targeted the unfamiliar prey type. These results were initially surprising until other studies were found demonstrating that non-exploratory behavioral types tended to be more aware of their environment and thus were more discriminating in their interactions. In this case, non-exploratory individuals may not consume as much as their exploratory counterparts, but they may be more selective in what they eat. Among the prey to choose in this experiment, the unfamiliar prey, bluegill (Lepomis marochirus), had a higher energy density than the familiar invertebrate prey. Based on the differences between explorers and non-explorers in their consumption of fish versus invertebrate prey, a second experiment was designed to investigate how potential diet differences between behavioral types could affect predator development and habitat use in a more natural setting (Picture 2). An equal number of explorer and non-explorer juvenile Largemouth Bass were added to ponds with and without bluegill prey, and growth, survival, and diets were compared between behavioral types in the different treatments. Growth and survival rates were similar between the two behavioral types, but there were pronounced differences in the diet between explorers and non-explorers, especially when bluegill were available. 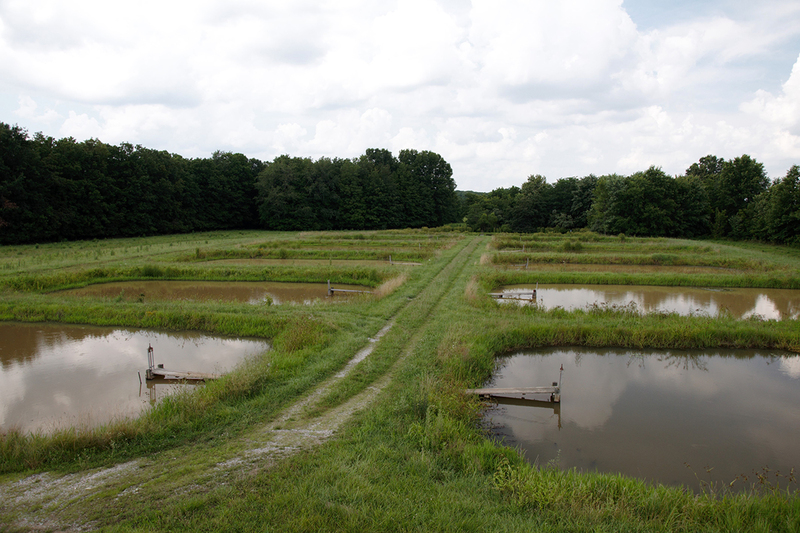 Picture 2: Tenth-acre ponds used in exploring growth and diet differences in Largemouth Bass with different behavioral types. Early in the experiment, non-explorers consumed more bluegill prey than the explorers did, supporting the laboratory experiment results that non-explorers target bluegill in a more discriminating manner than the other behavior type. Later in the experiment, bluegill largely outgrew their vulnerability to Largemouth Bass predation, but they still had an indirect effect on Largemouth Bass diets. With no bluegill present, zooplankton made up a small proportion of Largemouth Bass diets for both behavioral types; however, in ponds with bluegill, zooplankton became scarce and the two behavioral types switched to different prey. Non-explorer Largemouth Bass consumed more aquatic macroinvertebrates, whereas explorers replaced zooplankton with terrestrial invertebrate prey. Since terrestrial invertebrates are consumed at the water surface, these results suggested that explorer and non-explorer Largemouth Bass may forage in different areas within a water body. If the two behavioral types use different resources and microhabitats, individuals in systems with a mix of different behavioral types might experience less competition than populations in which all of the individuals are of the same behavioral type. Picture 3: Mesocosm tanks used to examine the effect of populations with different behavioral type compositions. 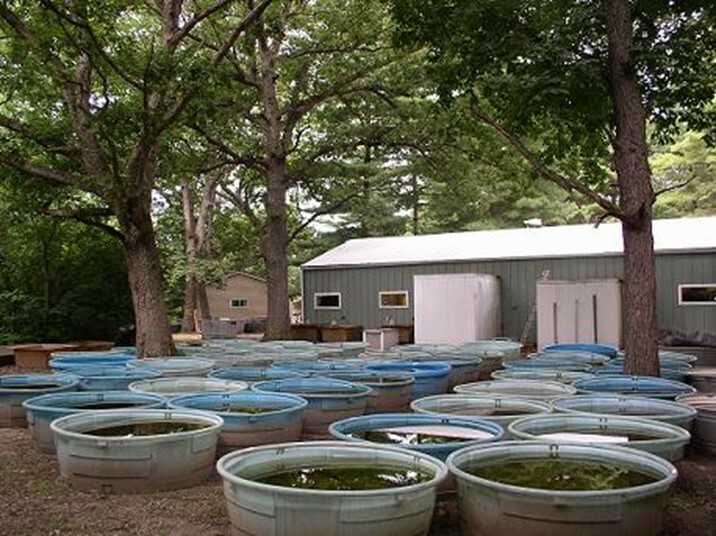 The final experiment addressed this question by measuring growth and survival rates in mesocosms stocked with either all explorers, all non-explorers, or a mix of both behavioral types (Picture 3). As predicted, both explorers and non-explorers performed better when mixed than they did when only one behavioral type was present. Both explorers and non-explorers lost weight when only their behavioral type was present, but both types gained weight when combined with the other behavioral type. Our studies have shown that Largemouth Bass have distinct behavioral types (i.e., personalities) and that these different types affect predator-prey interactions and possibly habitat use. The explorers tend to have a relatively indiscriminant diet, consuming any prey they encounter, while non-explorers discriminate in their diet selections, focusing on the most profitable prey items. These differences in prey consumption may lead to differences in where these individuals reside within the environment and ultimately affect how many individuals a system can support. Ecosystems with a mixture of behavioral types, where individuals may spread over a wider range of habitat types than systems with less behavioral diversity, may have comparatively less intense competition, and therefore, support larger populations. Our research continues to investigate the types of environmental factors and management practices that give rise to these different behavioral types to better understand how to properly conserve and manage these exploited populations.